The hair on an elephant’s head is beyond bristly. 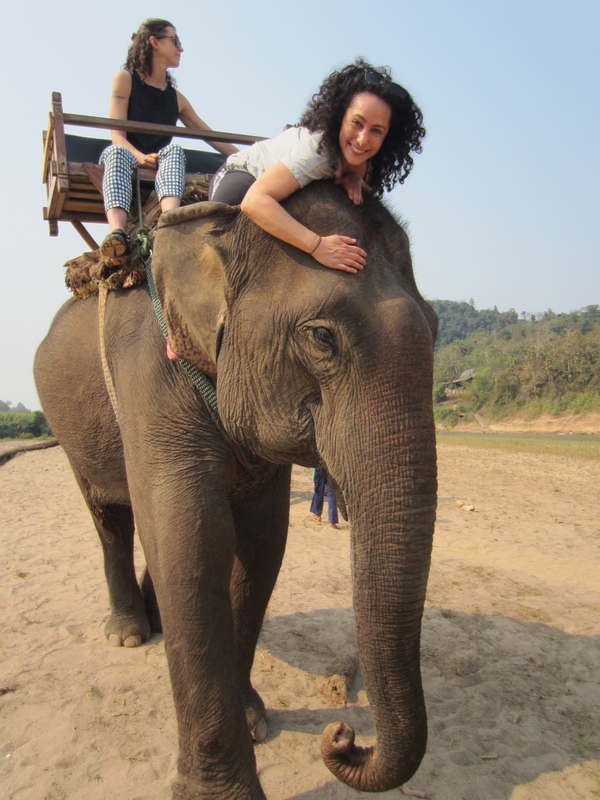 It’s sharp and needley, but that did not stop me from wrapping my arms around my new pachyderm friend, a rescued logging elephant who now spends her days doing far easier tasks with shorter hours, more medical attention and more food. I pretty much fell in love with her at first sight, and my heart was up with every powerful step she took. It’s a teary feeling to be that close to an elephant. 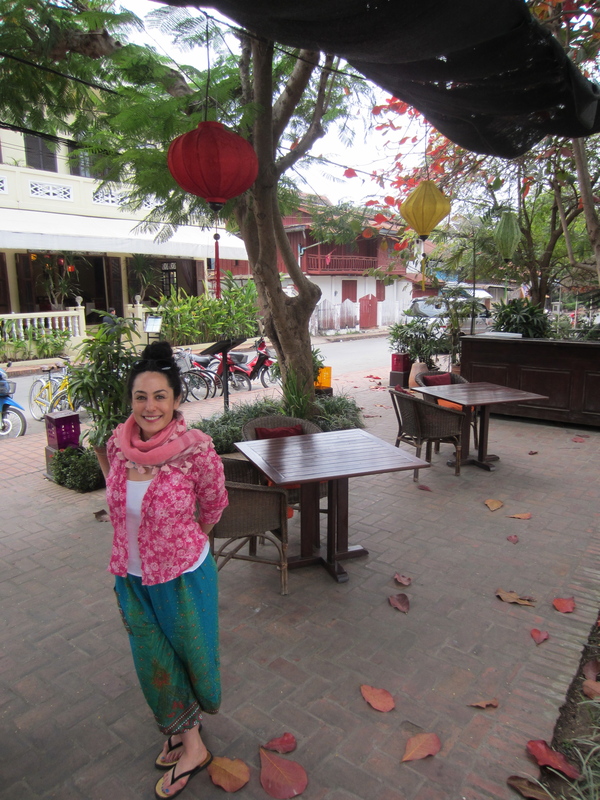 The whole time I was with her I wanted her to be out in the wild, free, but that is not to be — Laos is a country where everyone, from the animals to the people, works hard. 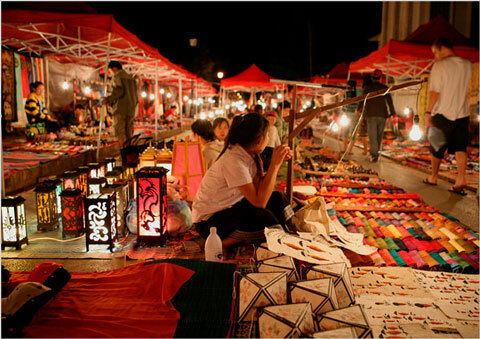 But amid the struggles and the emerging economy, there’s much to take it and much to savor, from intense and expansive natural beauty, to kind people, vivid flavors and a feeling of peacefulness and slowness all around. I returned from my trip there a month ago and I am doing my best to hold on to that essence, to those colors, to the richness. 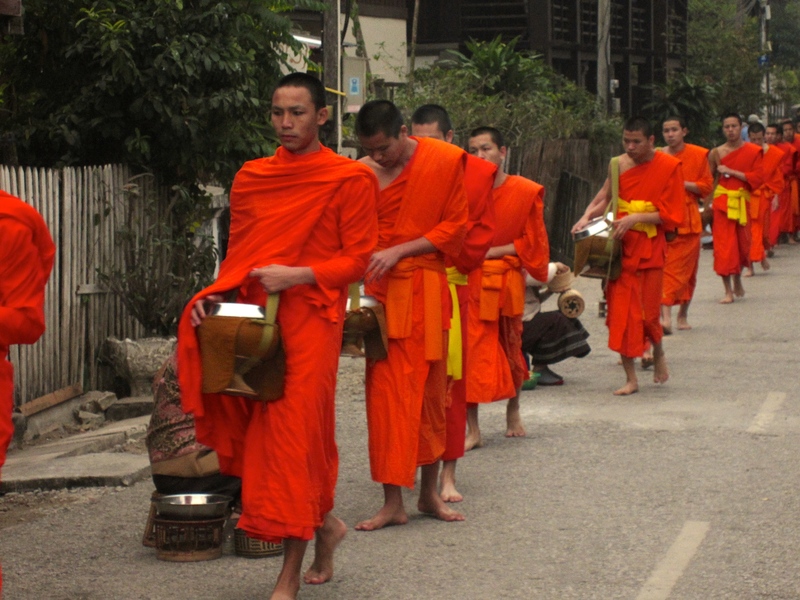 Laotian monks collecting their daily meals, donated by the community. Happy group! The Kaung Si waterfall is followed by cascading pools that feed into each other like a long stack of cascading dominoes. The water is chilly but super refreshing and clean. Blue Lagoon remake, anyone? Also traveling with us was the lovely and Jivamukti-trained yogi-extraodinaire, Kari Zabel. Kari lead our class daily and once more I realized that nothing but time on the mat will elevate your practice. 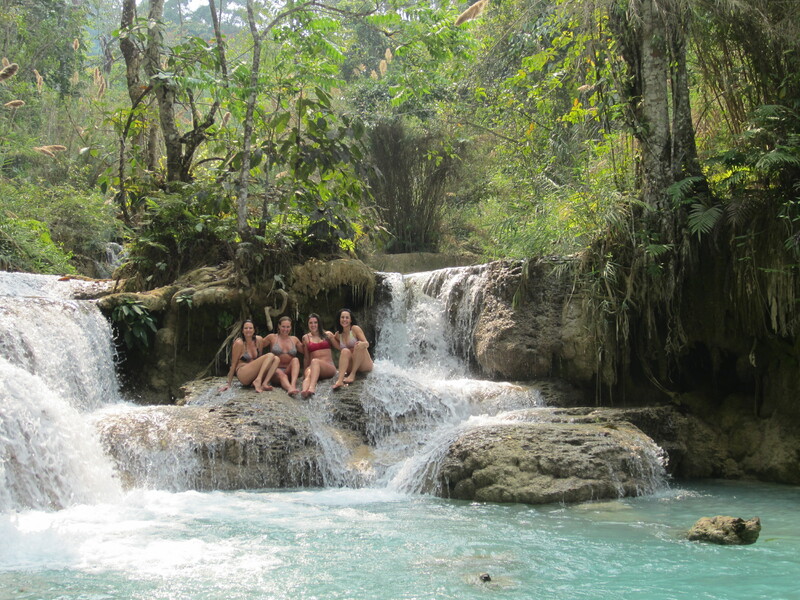 Our poses came in handy when we hiked through the jungle to arrive at the stunning Kaung Si waterfall surrounded by cascading natural pools. We hopped in and did our best tree poses amid the rushing torrent of water, making Kari proud. Now that’s how to commute. 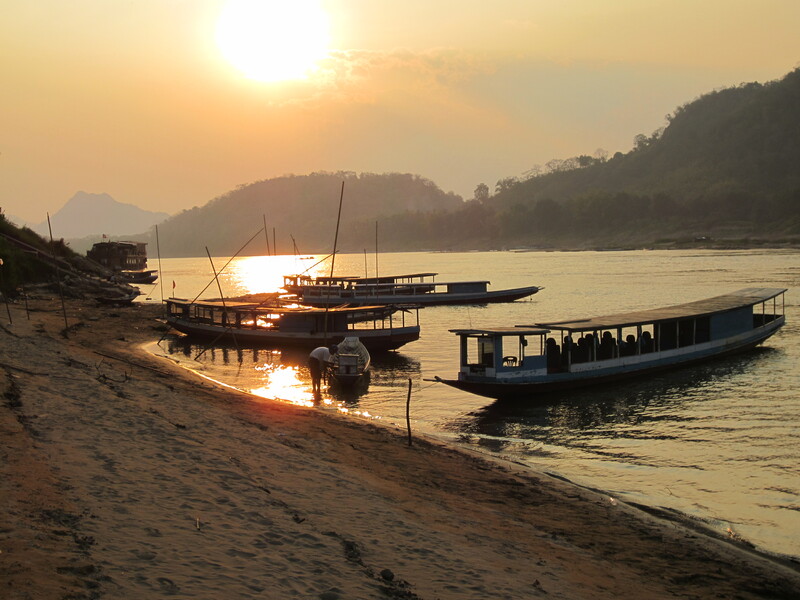 These skiffs are the best way to travel up the Mekong – they are fast and light and have no depth to their hull so they glide in shallow water. 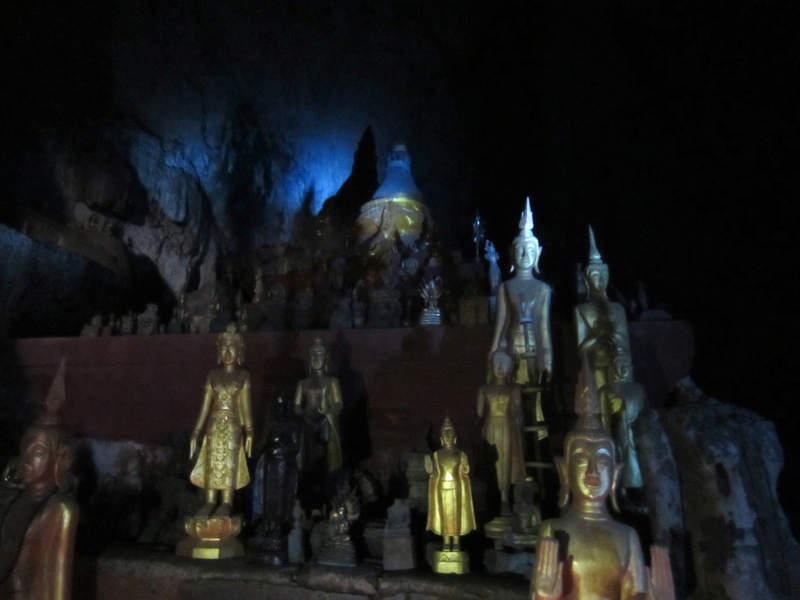 The Pak Ou caves, a pilgrimage site on the Mekong, house thousands on Buddha statues.